Criminal Justice students Josh Hall, Tara Sample. And Kayla Garcia dropped off “thank you” gift bags to Ferguson Township Police on National Law Enforcement Day. 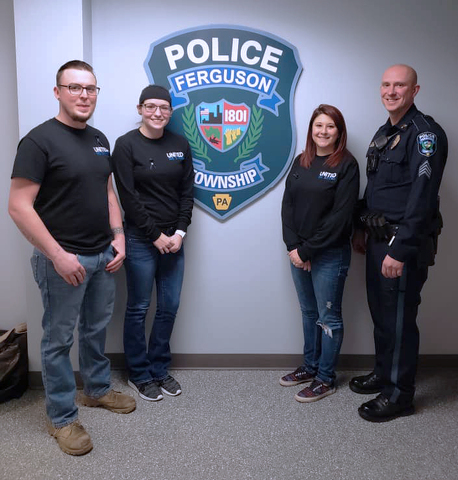 STATE COLLEGE Members of the COPS (Community Outreach and Public Service) club at South Hills School of Business & Technology’s State College Campus recognized National Law Enforcement Appreciation Day, which has been observed annually on Jan. 9 since 2015. LEAD was established to recognize the challenging career and situations law enforcement officers are faced with each day. In December, the COPS club held a spaghetti dinner to raise funds to help it pay tribute to local police departments. Using the proceeds from the dinner, the club put together 95 gift bags, and on National Law Enforcement Day, delivered them to Patton Township Police, Ferguson Township Police, State College Borough Police, Bellefonte Police, Spring Township Police, and the Centre County Sherriff’s Office. As an additional token of appreciation, the members reached out to Kris McCloskey Group Daycare Home, Marion Walker Elementary School and Abba's House Babyland Daycare and Preschool to have their students write thank you letters to local law enforcement officers to implement in each of the gift bags.